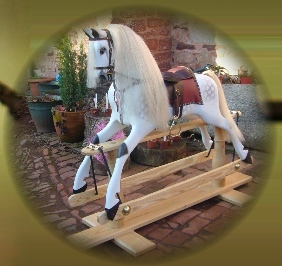 Torquay is the home to our beautiful range of rocking horses which are hand made to traditional design and finished to the new owner's own specification. Each horse is crafted and unique in features and finish. Prices quoted are based on traditional grey dappled paint work, real horse hair mane and tail, de-luxe leather saddle, bridle and fittings. Please contact us for pricing of natural wood finish as this will depend on the type of wood required. We are not VAT registered. We do take most major credit and debit cards and now offer flexible monthly payment options to suit (please contact us for further details). Please see the Our Horses page for a gallery of other work. For a fully carved rocking horse, please allow a minimum of eight weeks from acceptance of order to completion. Prices do not include delivery but this can be arranged. We deliver all rocking horses ourselves to minimise damage. Please see our delivery page for more details or contact us. Your very own special Zebra. Please contact us for pricing as these are very special creatures and each one is bespoke. Large enough for an adult to ride and for a child to enjoy for many years. A very popular size of horse for children up to 11 years of age. The Cocky Rocky is a more contemporary styled horse and would grace the most modern of homes. He is suitable for children up to 4 or 5 years of age. The perfect gift for the younger child with a secure seat and gentle rhythm, yet small enough to store for future generations. Named after our German student, Simon, who was with us on work experience in the summer of 2010. His project was to produce a budget priced horse with appeal for everyone. No space for a rocking horse? Our miniature horses are big on craftmanship but small enough for the corner of your living room. Available on either bow or safety rockers they are purely ornamental and are not designed to be ridden. The Miniature Rocking Horse's finished size will be approximately 900 mm long by 540 mm high and 220 mm in width for a bow rocker and 670 mm long by 530 mm high and 240 mm width for a safety rocker.